Make dining out in the garden an elegant experience with this outdoor furniture set which has a green wash giving it a weathered appearance. The centre of the table is intricately carved with a geometric Art Nouveau inspired pattern of swirling curvilinear lines. The middle panel is adorned with a stunning Fleur-De-Lys design which is also incorporated into the ornate chairs creating a sophisticated unified design. This Dining Set features a striking table and two chairs that are crafted from powder-coated wrought iron making it extremely durable and weather resistant. 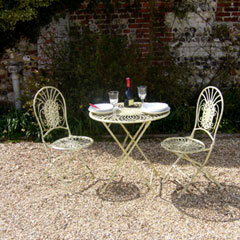 Wrought Iron Abbeydore Table: 73x73x73cm high.Chairs: 39x50x93cm high. Our community of gardeners have a wealth of experience, beautiful garden and great photos, discover more on the following pages: patio ideas, patio furniture, furniture ideas. See all wrought iron patio sets.